1. Drive smoothly. Avoid sudden acceleration and do not apply the brakes frequently. This not only keeps the vehicle in good condition, it also helps you save fuel. 2. Rules at traffic signal. When you are nearing a traffic signal, slow down gradually. When you start, avoid accelerating immediately. Always switch off the engine while waiting for the light to turn green. Waiting with the engine on for more than a minute means more fuel consumption. Comparatively, the engine uses lesser fuel to restart. 3. Use of air-conditioner. Avoid using the air-conditioner whenever possible. ACs use about 10 per cent extra fuel. You can also try switching it off after sometime and let the fan circulate the air, especially when you are about to reach your home or office. 4. Driving at speed. When your car is in speed, it is better to keep the windows closed and the air-conditioner on, open windows can affect the cars aerodynamic efficiency. 5. Parking. Always try to park in the shade, as it will take less time to cool down the car once you start driving again. 6. Weight rules. Don't overload you car. Travel light, the heavier your car, the more fuel it will consume. Every 50 kg of additional load will increase fuel consumption by 2 per cent. 7. Maintenance. You must maintain the engine in good condition. A bad engine can cut the car's mileage by as much as 20 per cent. The spark plugs must be checked regularly. The engine oil should be checked and used according to the car manual specifications. Make sure air filters are clean. Regular maintenance and servicing your car is very essential. Always keep you vehicle clean. A clean car offers less wind resistance. 8. Lubricants. Change the lubricant at regular intervals. Use only branded oil recommended by the manufacturer. It is also advisable to use an engine flush before changing the oil to remove dirt in the engine. 9. Handbrake. It is always better to use the handbrake than the clutch and accelerator when you want to halt for a little while. 10. Clutch. Avoid driving with your foot on the clutch, it leads to more fuel consumption. Use the clutch carefully only when changing gears. 11. Tyres. Always ensure the tyres have the right amount of pressure. A good inflated tyre makes your drive smooth, safe and efficient. 12. Gears. You also have to be very careful about changing gears. A higher gear at low speed and vice versa will lead to loss of more fuel. You must shift gears carefully and according to the desired speed. This will cause less strain on your engine. 13. Getting started. When starting the engine, just give about 30 seconds to warm it up. It warms up faster on the road. Don't accelerate before the engine has warmed up. This also results in loss of fuel. 14. Planning. Plan your routes very carefully. Sometimes taking a longer route helps as you may be caught in a traffic jam in the shorter route. Also plan your trip in such a manner that you can get several things done in one trip. 15. Public transport or car pooling? Try traveling by public transport at least once or twice a week to office. It helps in reducing traffic snarls and will be a good change for you as well. The other alternative is carpooling if you have to travel long distances. Avoid traveling to holiday destinations by car. 16. Exercise your legs. Don't take your car to nearby places. It always uses more fuel on short distances. Once in a while forget about your car and walk down the road to the grocery store or the nearby park. Walking is good for your health as well! 17. LPG/CNG. 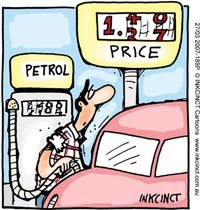 If you still find the petrol bills too high, you can switch to cheaper and cleaner fuels like the LPG/CNG. These will help you cut your fuel costs by 30-40 per cent. They also emit lower levels of polluting gases. Very useful tips for me and the rest of us. I am quite a heavy footer so I guess it's time to 'tame' things down a bit. :D Thanks Joyce! Yeah, not owning a car in KL nowadays is almost equivalent to disability.